Prime Minister Benjamin Netanyahu will meet with Russian President Vladimir Putin on Wednesday, 9 May 2018, in Moscow, in order to discuss regional developments. 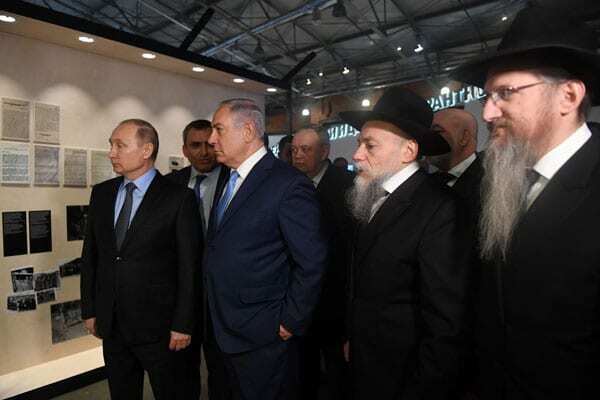 Russian President Vladimir Putin, Israeli Prime Minister Benjamin Netanyahu, Environmental Protection Minister Ze’ev Elkin and Chief Rabbi of Russia Berel Lazar meet in Moscow at the Jewish Museum and Tolerance Center, Jan. 29, 2018. President Putin invited Prime Minister Netanyahu to join him at the parade for Victory Day over Nazi Germany. The leaders will meet at the Kremlin after the parade. The meeting will be in continuation of their telephone conversation this past Monday (30 April) during which they decided to meet soon.